Personal liability protects you as the homeowner against lawsuits, liability issues, and problems when others are injured on your property. Often, liability coverage is less with mobile home coverage than with traditional homeowners, so some owners purchase additional liability coverage to protect against hefty lawsuits. Physical damage protects you against the devastation from a range of possibilities including fire, hail, wind, theft, vandalism, etc. The amount of coverage depends on the overall value of the home and your personal property, which can vary widely between homeowners. 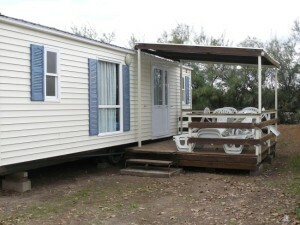 One of the benefits of mobile homes is that they can easily be moved from place to place. Families often take their home with them when they relocate, and avoid all the hassle of buying, selling, and renting. However, transportation is often not covered under a typical mobile home policy, leaving homeowners vulnerable to extensive property damage as a result of moving. Checking in with your agent and reviewing your coverage before moving the home is the best way to protect against possible damage. Mobile homes face many of the same risks of site-built homes including fire, flood, vandalism, wind, rain, and other named perils. The difference is, many mobile home owners do not insure their homes with adequate coverage to completely replace the structure if necessary. Reviewing your coverage amounts with a professional at least once a year is crucial. In addition, basic safety steps can help keep your home safe including installing and testing smoke detectors in every bedroom and hallway, regardless of the size of home. Ensure that all windows in the bedrooms open adequately if necessary for an emergency exit from the home. Keep furnaces and space heaters away from flammable items such as carpet and draperies. Keep high value items out of sight from windows and doors, do not place a safe or expensive memorabilia directly in front of a window, this only entices vandals. Keeping your home safe is essential to maintaining a happy and secure lifestyle. Finding the right insurance policy is very similar to finding the right home. It should provide the coverage you need, at a price that works within your budget, and provides all of the necessary protection you want.